The Epic of Gilgamesh, one of the oldest historical works of literature, is an epic about a king and his beast-man companion, Enkidu. Although various sections of the work exist, the most complete version of the story was found in the library of a 7th Century BC Mesopotamian King named Ahurbanipal. Written on 12 clay tablets, the epic tells the tale of the selfish reign of King Gilgamesh and how the gods created a companion for him (Enkidu) in order to humble and balance his unruly character. Now, the reason I am delving into this fascinating historical literary lesson is because it is believed by some that Enkidu is an original werewolf. The tablets say that Aruru, the goddess of creation (also of the earth and fertility), created Enkidu from a pinch of clay, and that he was born a man, completely covered in flowing hair, running with the wild beasts of the mountains and forests. In times since, he has been discussed as the god of animals, the patron saint of wild beasts, and considered the cast of the natural man. His tale has been considered by some as the first literary record of werewolves. And although previously thought to just be a favored ‘fairytale’ and nothing more, recent artifacts have been found that point to the credible existence of Gilgamesh, that he was a real King in 27th Century BC Mesopotamia. These artifacts then heighten the excitement surrounding what is believed to be the first ever werewolf record in history. Unfortunately, whether on papyrus drawings or in stonewall carvings, Enkidu is depicted as a bull-man, complete with horns, hooves, and a tail, and never resembles anything close to a wolf. In fact, in one carving he resembles a baboon more than any else. Similarly, if you were to read the translated text, you would find that although Enkidu is a beast-like man, he wandered with wild cattle (not wolves) and ate vegetation (not human flesh). In the story, he has a weeklong sexual encounter with a harlot named Shamhat, and once civilized, he shaves, dons human clothing, and learns to speak. He even downs seven mugs of beer the first time he’s introduced to human food. No full moons, no terrorizing the villagers, no howling, not even a bark. In reality, he sounds more like a case of hypertrichosis than that of the curse of the werewolf. 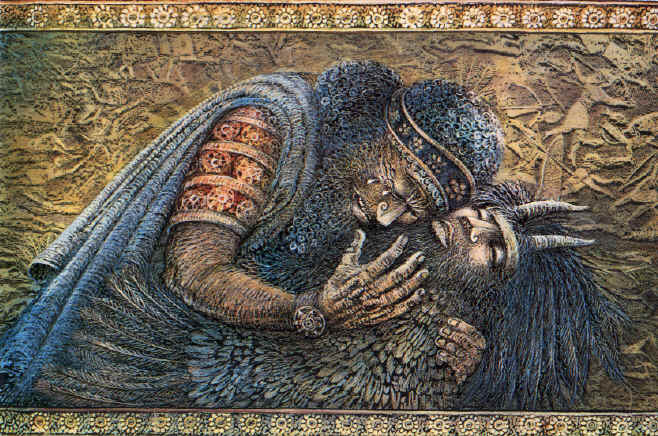 I hate to break this unfortunate news to us werewolf lovers, but unlike the Final Fantasy version of Gilgamesh’s sidekick, the literary character of Enkidu is nothing more than a beast-like man. And although Gilgamesh probably existed, the genuineness of the story is also questionable, figuring in the high dependence on mythological gods in the plotline. So whether Enkidu even actually existed will have to remain a mystery or matter of faith, along with the validity as to what his true form really was. Another let down, I know. But hey, you win some, you lose some. At least we can base our history on real-life facts now, rather than popular culture.